The coach was leaving Leeds at 9.30am today and I got there in plenty time. After a quick look at some of the Bremner Stones, with pickups at Wakefield, Chesterfield and Tamworth, we headed to Porthcawl for our pub stop. After sunshine most of the way down, it started raining but luckily it stopped by the time we got off the coach. I made sure we got a photo of a group of us at the sea front as soon as we got off the coach and posted it straight away on Twitter and Facebook (unfortunately we couldn’t go onto the beach as it was cordoned off). The story of Leeds fans everywhere continued as the chap I asked to take a photo of us turned out to be a Leeds fan, although he was not wearing his Strongbow shirt! At the pub we sat outside enjoying the sunshine, when the chap who took our photo for us pulled up on the road next to us and shouted to us. His grandchildren didn’t look too impressed though! Martin made us laugh when he started talking to the lad next to him on the coach about a book he was mentioned in and found out he was the writer of it! It’s a small world. We had a lovely three hour stop with good company, lots of laughs and something to eat and drink. We got to the ground around 7pm and it was a shock to see two armed police stood there before we entered the compound. I was surprised to see them and also that the away area was cordoned off. There again they were making sure we didn’t have a repetition of the last time we were there, when some windows on the buses back to the station were put through. 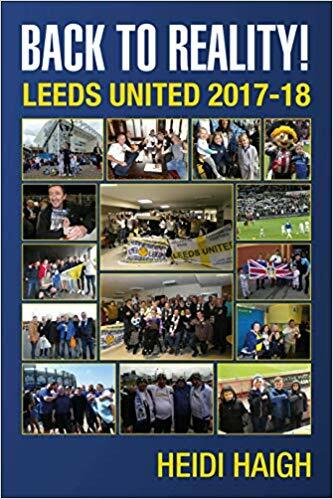 When we had played Swansea at Elland Road in the same season, there were many Swansea fans who via the internet said they also liked Leeds. I’d been stood at Billy’s statue when a lad approached me asking if I could take a photo of him with Billy which I did. Unfortunately there were some younger Leeds fans who took exception to the Swansea fans and I’m positive that’s why we saw the issues in our last visit sadly. We got into the ground relatively quickly and there were a lively bunch of Leeds fans under the stand. Thanks to all the fans who wanted their photos taken today and there were a lot that’s for sure. As two fans have requested purchasing all five of my books (the fifth is due out shortly), I will have to ensure I replenish my stock of a couple of them in readiness. My daughter Dani and I went to the top of the stand to hang my flag up and it was great to see so many flags today. What had been quite funny was us two saying goodbye outside the stand; we thought we were going in different entrances with Dani’s seat in the bottom whilst mine was in the top half. We found out inside that we were able to get anywhere in the stand after all. After Bielsa had named an unchanged squad, it surprised me when I saw Shackleton on the pitch. Only then did I find out that Cooper had injured himself in the pre-game warm up and had a hamstring injury. We could have done with his height that’s for sure as Swansea had some ‘brick s***houses’ playing for them. The team were: Peacock-Farrell, Ayling, Berardi, Roofe, Hernandez, Saiz, Alioski, Shackleton (making his full debut), Klich, Phillips and Douglas. Subs were: Baker for Phillips (28), Harrison for Alioski (45) and Bamford for Roofe (64). Score was 2-2 with Roofe (40) and Hernandez (79) scoring for Leeds. Attendance was 20,860 with approx. 2,100 Leeds fans who had sold out their allocation in minutes. Excellent support once again despite this being a mid-week game and live on Sky. Leeds came back from behind twice to get a well-earned point and went top of the league tonight (although there are other clubs playing tomorrow so that may change). As the game kicked off we found ourselves up against a tough team (they’d obviously been watching us). The ref A. Davies showed his true colours immediately and continued this for the whole game, booking our players and falling for every challenge giving free kicks galore. Their number 9 should have been booked for a blatant dive in the penalty area despite our player already running away with the ball he’d won when the player went down. The same player went nuts at the linesman when he flagged for a foul and the fact he got away with it didn’t go down well with the Leeds fans. He continued to rant and nothing was even said to him, unbelievable! Swansea took the play to us with constant attacking and not giving us a chance to settle. After Phillips was robbed of the ball, Swansea continued with the attack and we found ourselves a goal down sadly; although Peacock-Farrell got his hands to the ball he was unable to save it going into the net. It wasn’t surprising really although a little disappointing, but I knew we were up against it. Bielsa made an immediate change taking off Phillips and bringing on Baker. We had been struggling to stop Swansea attacking and it was a bold move from Bielsa. As this was the first game this season that we had gone behind, it would be interesting to see how we would react as a team. Well the team didn’t disappoint, we managed to get an attack on their goal and it was great to see Roofe put the ball into the net to equalise after great work from Shackleton on the right. This was the half time score and at least we were still in the game. As the second half kicked off and with the Leeds fans in good voice, Bielsa made a further change when Alioski was replaced by Harrison. I’d notice Alioski had his right hand bandaged and when I mentioned it to Dave who stood next to me; he said it had been like that on Saturday. I hadn’t noticed it but then realised I’d not bothered putting my glasses on so no wonder! Things took a turn for the worse again as we found ourselves behind again when they scored a second goal. Damn! I’d started to get butterflies in my stomach but I still hoped we could get something out of the game. Without looking at my photos (I hoped I captured the moment), when Bamford got past their player on the wing and passed the ball across to Hernandez in the penalty area, I had my camera poised as there was no way he was missing that one. The equaliser sent the celebrating Leeds fans into raptures and at that time I felt we could go on and win the game. Shortly after Swansea were through on goal and it looked like they were going to get the winner, only for Peacock-Farrell to make a fantastic save with his feet to deny them. Leeds came into their own then as we found our feet and looked all on that we would get that winner only for their player to go down “injured”, I mean time wasting in the penalty area. Still as the final whistle blew and despite the draw meaning we’d dropped our first points of the season, the team got a fantastic reception from the Leeds fans. It was lovely to see George get Berardi’s shirt at the end of the game too. George had been mascot plus it was also his birthday so he’d had a great day and a birthday to remember. It was Berardi’s 30th birthday today too, plus Phillips (100) and Alioski (50) also reached milestones with games played. As I went to get my flag at the end of the game, someone helped me climb over the seats only for cramp to start in my calf and feet again, ouch! I know we didn’t play too well at times today, but we showed character to come back from behind twice and get something from the game. At one time we would have capitulated and been beaten so I will take the positives from today. Bielsa definitely takes things seriously, seeing him getting up off the bucket and taking everything in about the game is good to see. The fact that he changed things quickly is also a breath of fresh air too. Luckily I’m not in work in the morning but I know some people are so I feel for you. Personally I got home at 4am with a 20 hour round trip behind me. The Liberty Stadium hasn’t been a good hunting ground for us or Vetch field (Swansea’s old ground) so I’m happy with a point. See you at Norwich on Saturday for another tough game. See you then, LUFC – Marching on Together!